Since it’s so gloomy, I finished sewing together another afghan, now all that’s needed is crocheting the border and inserting a Teeny Beanie in the pocket and it’s ‘good to go’! (With all the Premie cap knitting, I’ve kind of slipped a bit on sewing together afghans, but I’ll get back to it now that the weather is cooler. (It’s now 66 degrees with 83% humidity – looks like we’re in for more rain soon…sigh). In large saucepan over medium heat, cook bacon until crisp.Remove and set aside. In bacon drippings, sauté leeks until softened, about 3 minutes. Add potatoes and chicken broth. Cover and bring to boil, reduce heat and simmer until potatoes are tender, about 15 minutes. Lightly mash with a potato masher. Add milk, corn, parsley and reserved bacon. Heat until hot, about 5 minutes. evenly over partially baked crust. Combine remaining 1 tablespoon brown sugar and cornstarch in small bowl; stir in cranberry sauce. Spoon evenly over cream cheese layer. Top with reserved crumb mixture. Bake 40 minutes or until golden. Cool. Chill. Cut into bars. Mix all ingredients with a mixer until well blended. Grease or spray pans. NOTE: This makes two large loaves or 5 mini loaves or make in a bundt pan. Start with a layer of bread batter, then sprinkle on the nut mixture, another layer of bread batter, and at the end sprinkle the top with the nut mixture and marble it all with a knife through the batter. Bake for 1 hour (40 minutes for the mini loaves ; 45 minutes in a bundt pan); or until a toothpick comes out clean. You can tell I’m getting into the Fall recipes – but those above really sounded hearty and good (especially the Pistachio Bread!). Hope you are having a nice,relaxed Saturday and are able to enjoy the weather and the season changes. I’m getting the urges for cider & donuts and crisp, sweet Michigan apples! PS: I should probably add here: we have both cars back home and running just fine AND I’m feeling JUST FINE! Kind of learning what I can and shouldn’t eat (just to be safe – no tomatoes – too much acidity) but I’m doing great! I’m not as pleased as I thought I’d be when it was completed (even considered re-doing it). It’s ‘cute’ but I feel the head is too big for the ‘body’ and the body could be larger as well. 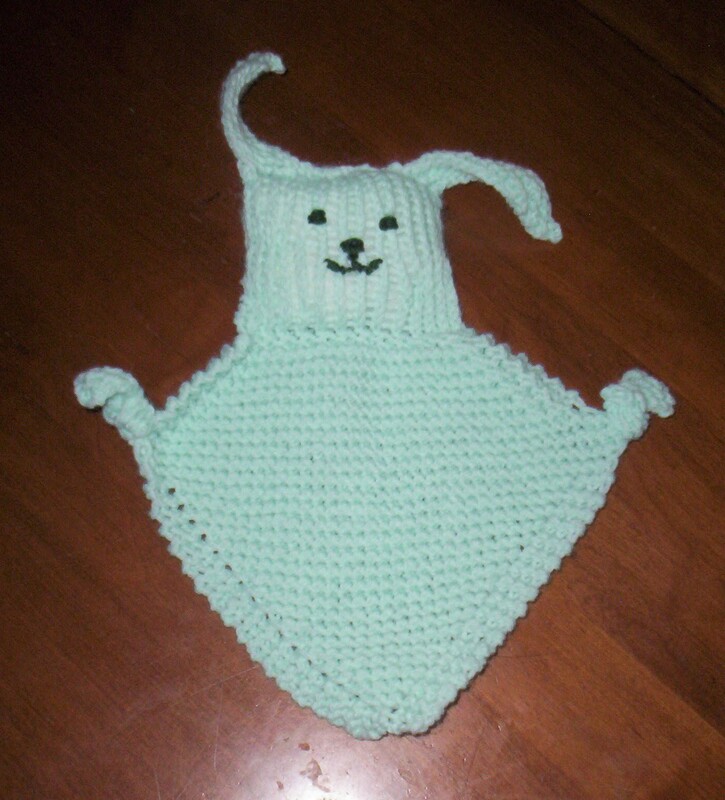 If you’re interested, it’s a free pattern on: http://www.lionbrand.com (it’s called “Blanket Buddy”). The body of it is actually the “Grandma’s Favorite” dishcloth pattern! This has been a very strange, stressful, crazy week. Already wrote about the Sunday/Monday hospital visit. Wednesday found my friend and leader of our special needs group in a ‘family emergency’ PLUS the other lady who occasionally helps lead our group had a death in her family, which left ME in charge! That wouldn’t be too bad except it was Music/Birthday night (our biggest turn-out of the month – 37 kids!). Let’s just say it was only by the Lord’s Grace that I made it through – it was not very organized (I forgot to open in prayer – remembered it later and did that), forgot to introduce a new young man (did that later, too), forgot several other things, but we muddled through – Whew! Yesterday (Thurs.) found me getting a phone call from my husband at around 7:15 a.m. telling me that his serpentine belt came off HIS van after he accidently drove through a puddle (remember a few months ago that happened to MY van?) and he was parked at Speedy Auto awaiting their opening – would I come and give him a ride home? Not a problem! (Mind you, it’s raining ‘cats & dogs’). Get there, park next to his car, he gets out and is loading all his tools & junk into my van when my van suddenly stops running! I try starting it – no go but the ‘oil’ light is on. Husband checks my oil, says it’s good and says try to start it again (while he’s looking under the van). “STOP! SHUT IT OFF!! !” he yells. Turns out it’s gushing GAS out of a broken gas line! GREAT! (BUT… it’s another of those “Praise the Lord” moments because what if that had happened to me Weds. night with a van full of special needs guys?) We leave both vans there and call our middle son (who was home sleeping) to come and get us. Husband takes the day off work, we wait until almost 7 p.m. and they finally call that MY van is ready. With no ride (they couldn’t come get me) I ended up walking there (it’s about 3 city blocks – good for my heart, yes?). Long story short – I stopped and got Subway’s for dinner and really enjoyed mine (I earned it after that walk!). Today (Friday) found my husband driving my van to his work and coming home around noon yelling: “Did they do anything with your Power Steering?” (yes they did-my power steering was leaking fluid all over the engine and serpentine belt – they said it looked like someone had put Vaseline all over the belt!). Turns out my van was leaking Power Steering fluid TODAY all over the place! Husband took it down and the guy apologized- apparently he got distracted yesterday and forgot 2 bolts!!! Fixed that(no charge-as expected) gave us a quart of oil free, and now we’re waiting for husband’s van to get fixed! What a WEEK!!! UGH! Just keep thinking of that short Bible verse that says: “This, too, shall pass.” Boy, I sure HOPE so!!! Hoping YOU are all having a great week! 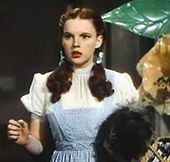 I’m joining Dorothy (aka: Wizard of Oz fame) in quoting: “There’s No place like Home-there’s NO place like home!” Let’s see – how do I begin? Sunday was a busy day – got up and grabbed a small slice of cold pizza for breakfast, went to church. Came home, ate a plain hot dog (no bun) and a small cookie, then took a nap until 4 p.m. (had choir practice at 4:45). Went to choir, then church & communion; got home around 7:45 and thought: “Wow, guess I’d better throw something together for dinner!” and began chopping up some fresh tomatoes. If you’re anything like me, you throw some of those tasty treats in your mouth while chopping – which I did (ate about 1/4 C. ). A few minutes later began having a very hot, burning sensation in the middle of my chest and it kept getting more intense – I went to lie down. It didn’t get better, just more painful and began to feel like it was going under my left armpit- we called 911. To wrap this up a little, spent from around 8:15 Sunday night until around 1 p.m. Monday afternoon in the hospital. Many tests, some really vile tasting stuff (with Lidocaine to numb my digestive system), a treadmill stress test, Ultrasound of the heart, etc. turns out it wasn’t a heart attack or anything to do with the heart … it’s GERDS (Gastro -Esophagial Reflux disease). I should insert here that the pain stopped about an hour after being in ER (and drinking that vile liquid plus a Pepcid tablet). To say I wasn’t frightened would be putting it mildly – did a lot of praying, but I thank the Lord that He brought me through it and I’m here to ‘tell the tale’. My doctor said that as long as I’m faithful in taking the Pepcid tablets twice a day, I should be just fine! WHEW! That’s ALL??? I’m very grateful! Met a lot of very nice doctors, nurses, and the three very nice firemen who took care of me in the ambulance. Praise the Lord I’m here today – back to my old schedule and kind of watching what I put in my mouth as well as remembering to eat on a more frequent basis! I know better (being Type 2 diabetic, controlled by diet) but just forgot when I got too busy! Not a good thing!!! Spent most of Monday sleeping and resting. That’s what’s going on around here these past few days – yes, it was ‘out of the normal’; can’t say that I’d want to repeat it any time in the near AND far future! It’s now Friday and the wrapping up of an unusual (but good) week. Tuesday found our youngest starting 11th grade; I was totally amazed at the size of the Literature book he brought home – it must weigh at least 5 lbs. and is very close in size to our local phone book! It’s HUGE! With school starting comes a whole new bunch of ‘activities’ like the two choirs he’s in plus the added Color Guard (Band) and now he wants to be in Drama , also (do we hear a lot of “Mom driving” in the near future?) Right now he’s at Color Guard practice before their second football game at 6 p.m. Our weather has gotten colder lately and I’m guessing it will be around 60 degrees when their game is going on (it’s now 68 degrees at 5 o’clock). Middle son is doing much better; tires easily but that’s expected from the Mono – his throat looks 100% better that a few weeks ago! He’s back at work (and, of course, I bug him to try to rest as much as possible). Husband is enjoying the last few days of his vacation before having to return to work Monday. Along with his ‘enjoyment’ he’s had to put up with me going through the ‘fun’ of my first Colonoscopy…ah, the ‘joy’. Actually, the procedure was a walk in the park…it’s the taking of and ultimate results of the tons of laxatives that did me in! Not to gross anyone out, but I was a limp dish rag by the next morning, having endured much more than was expected (ended up with dry heaves at the end, too…not fun). I did lose 6 lbs, though! (the hard way!) End results of the test was I’m good! Husband was kind to get take out Chinese food for my first solid food in 2 days; I ate, then promptly took a nap for 2 1/2 hours (they told me I’d be tired after the test). It’s now ‘the day after’ and I’m feeling fine! Had a 1 p.m. doctor’s appointment for meds and even they were surprised I was doing so well! 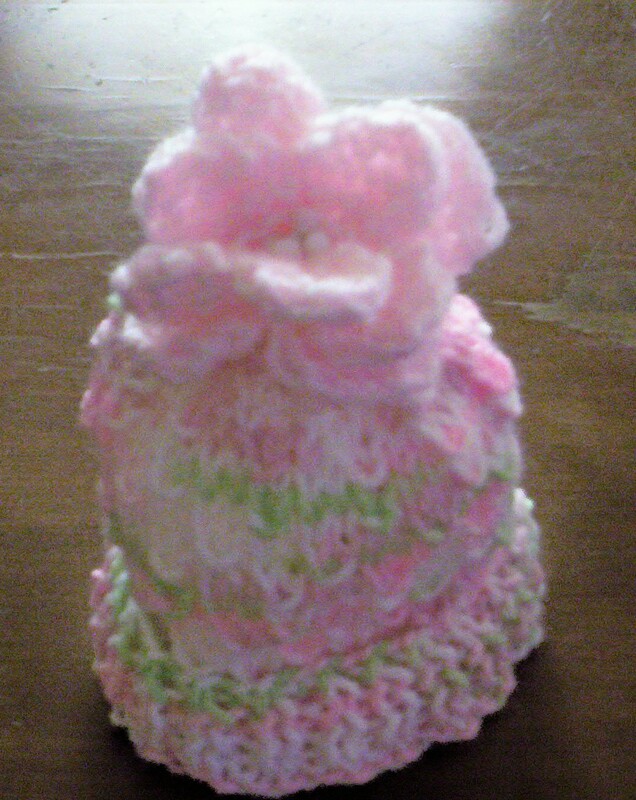 I feel fine and have all my energy back; actually thought I was done knitting the tiny premie hats but ended up knitting one while ‘enthroned on the porcelain throne” simply because I couldn’t leave my throne at the time and was bored just sitting there! Think I’m up to something like 13 now; started 2 more simply because I found 2 more baby yarns I didn’t know I had AND found a new, very simple pattern to try out…looks really cute on a baby hat (called “Elm Seeds”). Tomorrow we have the pleasure of attending an outdoor graduation party for friends from our homeschooling days; they moved quite a way from here but are holding the party in a local park near us. Our boys are good friends with the family and it will be a good time of getting caught up on how things are going in their lives. The Mom & I used to teach Cooking classes together (she’s a MUCH better cook than I am! STILL remember her chicken enchiladas!) Really looking forward to their party tomorrow – she’s posted that they’ll be having roast pork tacos (and maybe fish tacos – never had them but heard they’re really great). I know that she’s been preparing and roasting at least 20-40 lbs. of both pork & beef, plus black beans and other ‘fixin’s – can’t wait! That’s about ‘it’ for the going’s on around here; just glad that my week is now slowing down some! Tonight I get to cook a dinner – first time in about 3-4 days now! Finished off the last of the leftovers for lunch: Middle son had leftover pork steak & some mashed potatoes, I had the last enchilada and husband had the leftover Chinese! It will either Beef Stroganoff, baked chicken or spaghetti – since we had spaghetti last week, I’m leaning towards the Stroganoff! Have a great weekend and don’t forget to fly your flag tomorrow (9/11)! PS: Still working on ‘the’ baby afghan; actually haven’t worked on the Ghana afghans at all lately-have one done but needs the crocheted border. For a change, the whole family was home for the entire day AND it’s been QUIET! (I would suppose that middle son being sick might help some there…); his throat is looking MUCH better and he seems more back to his ‘old self’. Youngest has lounged around the house all day in his jammies, knowing full well that tomorrow starts a new school year (he’s excited – 11th grade!). Husband is on the beginning end of his vacation so he’s happy to just hang out, play video games, read and take a nap. Me? I finished the tiny hats, knit a good 10+ rows on the baby afghan, started a book (and promptly decided it goes back to the library-too gory for my taste – just trying a new author…I don’t like her graphics) and made a HUGE Pierogie & Polish Sausage dinner. We ‘pigged out’ and there’s still enough leftovers for snacks tomorrow. (Both husband & I like grabbing the pierogies, cold, from the fridge for breakfast . . . and any other time . . . blush). Hope you had a nice, quiet holiday as well – did you remember to fly your flag? It’s been a nice day outside: temps finally (around 6:30 p.m.) got up to 72 degrees, otherwise it was a bit cloudy and in the 60’s, but that’s OK, too. 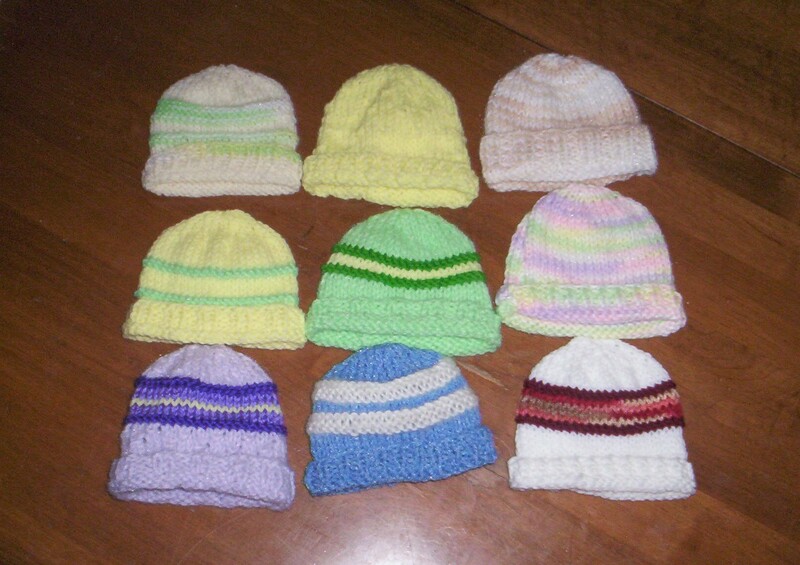 My knit group decided to join in on another good project, this time for “Save the Children” foundation’s “Caps for Good” – this is a knit/crochet caps for premature babies project. 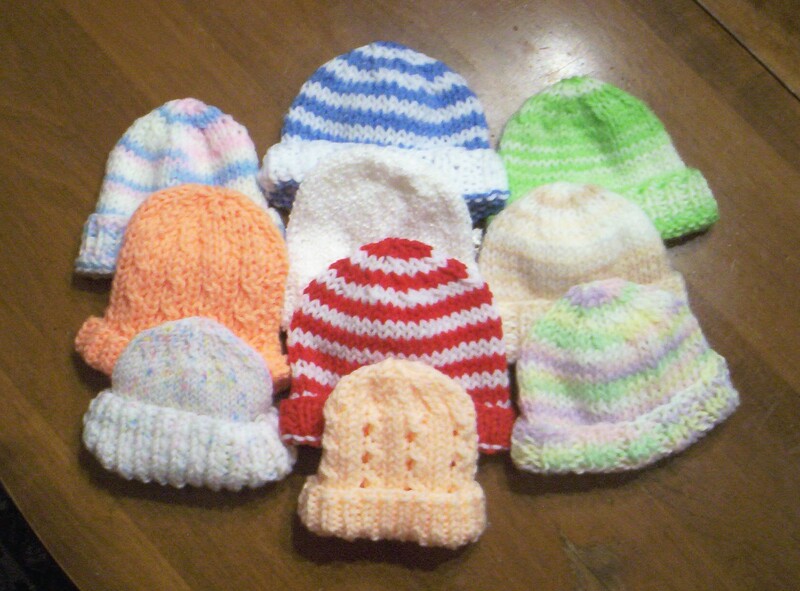 (http://www.savethechildren.org/publications/good-goes/caps_for_good_kit.pdf) They provide a simple pattern for either knit or crochet and since I love doing quick, easy projects, I dove right in. 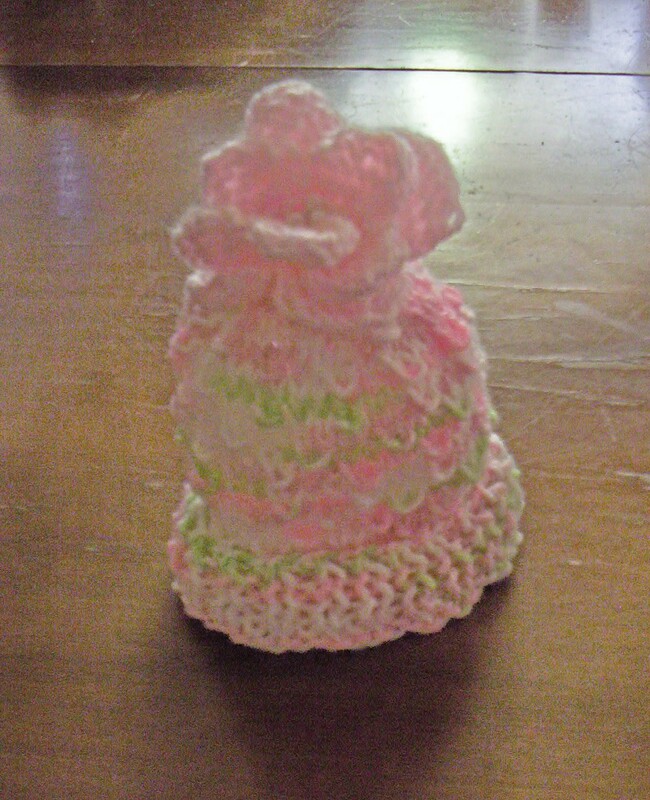 I’ve discovered that I can knit about 2 hats a day, in between my usually yarn work and other house/family efforts. Starting cap #6 today (will include a photo in another post of all my caps and, when provided, a group photo of all caps donated). The good thing about this project is you can use any yarn which gave way to my digging through my ‘stash’ and finding several really soft yarns of various hues. I love an easy project and this one is ‘the thing’ for me right now! Serve these special pancakes with hot applesauce sprinkled with cinnamon for a back-to-school treat. Spray a griddle or skillet with nonstick cooking spray. Blend oats, pancake mix and apple cider with a wire whisk until smooth. Pour a scant 1/4 cup of batter per pancake on a hot griddle or skillet. Cook about 1 to 1 1/2 minutes on each side or until golden brown. Serves: 4.
then roll in bread crumbs to coat. Arrange in single layer on baking sheet sprayed with cooking spray. Lightly spray strips with cooking spray.Bake until browned and fork-tender, about 25 min. Lightly sprinkle with salt to taste and Parmesan. garlic salt for the salt. Prepare a grill. Bring a large pot of salted water to a boil. water according to pkg. directions, stirring often, until al dente. salt, pepper and parsley. Toss well. Serve with Parmesan cheese. Place chicken in lightly greased 13 x 9 inch baking dish; set aside. Mix mayo and mustard until well blended. Spread top side of each chicken breast half with 1 T. of mayo mixture; sprinkle evenly with almonds. Bake 20 to 25 min. or until chicken is cooked through (165ºF). Place watermelon in a large mixing bowl; add egg whites and canola oil. watermelon mixture; mix together until dry ingredients are well moistened. Add other half of the dry ingredients and mix well again. or until toothpick inserted in center comes out clean. Cool on wire rack. Pour watermelon juice into a mixing bowl; add powdered sugar, butter and cream cheese. Beat with electric mixer on medium until mixture becomes smooth and fluffy; add food coloring and stir to incorporate. refrigerate cupcakes for a little bit before serving. Combine strawberries, lemon juice, and 2 T. granulated sugar. to come together, then stir in strawberry mixture. for up to 1 day. Makes about 3 dozen. That’s about ‘it’ for now; hope you and your family have a lovely Labor Day Holiday – however you choose to celebrate it! ps: As a side note, middle son is feeling a little better; having Mono is no fun and a very SLOW disease to recuperate from (no medicines to help it any). He’s still ‘dragging’, but seems to be a little more ‘himself’ and not so groggy/exhausted feeling and looking. As the doctor said: “Do what I tell you (rest, plenty of liquids) and you will feel like your old self in about 3 MONTHS – don’t follow what I say and you’re looking at 6 MONTHS or LONGER!”. Middle of the Week. . . Here we are at Wednesday already – amazing! This past week or so has just flown by; lots LOTS going on: took middle son to our Pediatrician on Monday (just tired of him not getting better, figured “Hang the cost** – he needs to get WELL!”). Got him right in, turns out it’s not Meningitis (which we knew) OR Tonsillitis – it’s MONO! (mononucleosis). Yes, he had all the symptoms. Doctor says no meds for it, just rest/plenty of liquids/more rest! Gave him a paper to get a week off work and another permission for no direct food handling (like slicing meats or doing food demos) for another week after that. We left there and took the paper to his work (they didn’t look too happy to see that, but what can we/they do? If he works, he just gets sicker!) It’s been days of making ice cubes and homemade chicken noodle soup (tried using broken up smaller spaghetti noodles instead of wide egg noodles – works great! They’re closer to what you get in a can of chicken noodle soup). He’s getting ‘some’ rest but mostly on computer or watching tv. The Pediatrician said that Mono is no more contagious than a cold – that was a shock for me! (I’m still being extra careful of what he handles – no ice cubes that the family also uses!). We certainly don’t need another person down with that! His throat is still very sore and he’s still got a slight fever (tonsils look horrible). The doctor gave him two choices: do what he’s supposed to do (rest/fluids, etc.) and he should get totally over it in 3 weeks or so; don’t do that and it could be closer to 6 months! While all the ‘sick room’ adventures are going on I’ve also been to another “Prop” meeting for the band (actually stood in the hot sun for 1 1/2 hours while 5 other people tried to hash out what they thought should be the final idea for these huge boards – what I’d call a non-productive meeting. I’m learning to just be a ‘stand in the background and listen’ person – these are all ‘seasoned’ band parents who each seem to have their own opinion (and they certainly aren’t shy stating them!). That’s not what I’m used to; I’m a more ‘give & take’ kind of person so I finally said (while pouring sweat and feet swelling from the heat) “I’m going home – call me when you decide what and when we’re painting.” (At least I got to log another 1 1/2 hours to my 10-parent-hours volunteering!). Last night was Knit/Crochet night and we had the largest turn-out we’ve EVER had in our 3 yrs – 25 people! One lady used to be in the group but moved to Portland, Ore. and was up visiting friends so she stopped by for the night; another member just got her new foreign exchange student from China (17 yr old young lady who’s been taking English for 7 + years and speaks just fine). The Chinese girl just learned the basics of knitting last night and was knitting up a storm; her “American Mom” said she’s already knit about 17 inches since yesterday! Great evening – lots of laughter, sharing, free samples from Panera – it was a bit hectic (I ended up forgetting to get the basic information on a new person!) but had a great time! Now we’re planning our first “Knit/Crochet/Movie night” for Fall – theme: American Food (for our Chinese girl – it will be at her American home): hot dogs, baked beans, potato salad, veggie tray, chips, and (as requested from her Amer. Mom) apple pie! Should be a lot of fun! Tonight is my special needs group; just managed to get the next 2 month newsletter done and mailed Monday (along with all the other ‘fun’ activities here lately). Our weather has been sweltering again (not quite as bad as the last time I complained, but it’s still got me carrying around a wet paper towel for my forehead/neck, swipe the face thing). It’s been in the 90’s during the day and 80’s at night – and humid! Managed to get the grocery shopping done early today only to find that our local Krogers is totally re-arranging their entire store – THAT was fun (not). Took me twice as long to just FIND things (while their extra staff was still putting things on shelves). Advice from one gentleman: “If you don’t find what you’re looking for, the rest of this shelf/area is in the next aisle – we’ve moving it all over there.”Krogers now wants all of their stores to be ‘uniform’, hence the rearrangement of our store. SIGH… I shouldn’t complain a whole lot – they had several shelves and cartsful of ‘stuff’ at the front of the store, marked down to get rid of it. Managed to find a large fry pan just like my old one (which is starting to get bowed on the bottom from use). The original price was $25.99, marked down to $12!!! YAY!!! I must use that pan at least 3 times every week for all sorts of things; it’s a great size – you can brown 5-6 hashbrowns, make a big batch of beef stroganoff, stir fry, cook probably around 8 hot dogs in it – great pan! (It’s a Mirro 12” deep covered skillet with clear glass lid). Looking at the rest of the week: there’s babysitting my grandson Thurs. plus driving middle son to band practice and their first football game, more driving middle son = full week this week. Next week starts school on Tuesday – and so my ‘running full time’ begins! Almost done with first big ball of yarn on the baby afghan; am using the “Pound of Love” yarn, which comes in a HUGE ball – just bought ball #2 a few days ago. This is going to be one BIG, HEAVY afghan when done; not sure if I’ll use the entire second ball, will determine that when it’s closer to 1/2 second ball gone. It looks nice but it’s very hot & heavy to have laying on my lap to knit it; baby’s not due until February so I might just put it aside until cooler weather – have to think about that. (Sure wish our air conditioning would be coming quicker!). That’s what’s going on around here (and a few things I probably missed). Hope you are having a good day, remaining semi-cool, and enjoying some REST! PS: Managed to get the dishes & laundry caught up Tuesday; dinner tonight is BLT’s! Bought some gorgeous huge tomatoes at the local fruit/veggie stand and couldn’t resist! YUM!! !